A Canadian has been arrested in Thailand after former clients of a down defunct recruitment company in Chiang Mai made police complaints that they had paid fees in 2013 for jobs in the United States and America that never materialised. The Canadian had been living in Thailand since then and Thai police suspect there may be others connected with his company who also lost money. It is understood that the Canadian denies deliberately defrauding the two individuals and has blamed a former manager of the company he established. 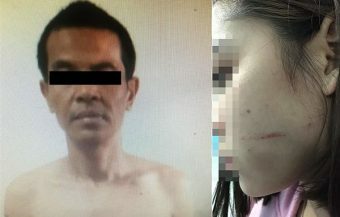 The man is facing a litany charges as Thai police conduct an in depth investigation into his company including claims that he fabricated job opportunities which were subsequently advertised online. 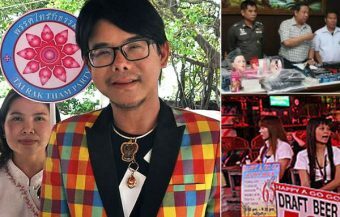 It appears that 37 year old Michael Roberge did not give up on his mission to offer employment opportunities to Thai students in the foreign hostelry sector. 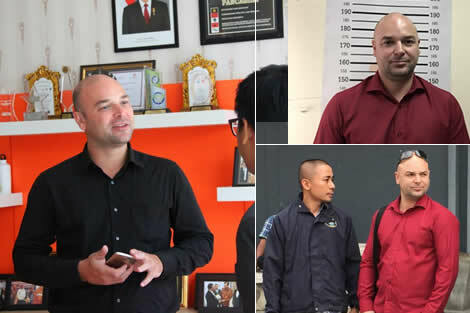 The picture on the left show him being received by a respected college in Bali while, on the right, the images show his arrest in Bangkok in October when Thai police executed a 2017 arrest warrant related to charges in Chiang Mai and his defunct Thai company – Work West (Thailand). 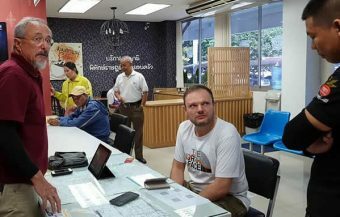 A Canadian man arrested by Thai police in central Bangkok at the end of October has denied any wrong doing in what appears to be a scam where a number of Thai nationals were defrauded out of arrangement fees paid to secure internships in hotels and hostelries in the United States of America. 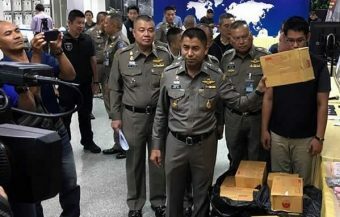 It is believed that two reported instances prompted the Thai police to conduct a deeper investigation into the Canadian and the company he established in Chiang Mai. 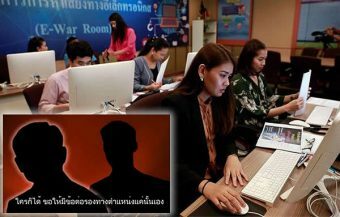 Thai police are concerned that there may be others who have lost money in the scam and have appealed for them to come forward. Two people who got scammed came to the police, but there should be more because he opened an entire company to do this. 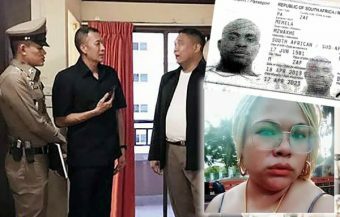 I think some people filed criminal cases, some didn’t,’ said the Police Colonel who arrested 37 year old Roberge at the Amarin Plaza building in Bangkok’s Pathumwan area in on October 25th. The business of an employment agency or education brokerage, bridging the gaps between Thailand and western countries, is an obvious opportunity that many foreigners look into when contemplating a lifestyle change to Thailand. Indeed there are companies operated by dynamic westerners from America or Europe now operating in Thailand providing a vital service and offering a rewarding lifestyle for the successful operators. Most of these companies offer educational opportunities with foreign educational facilities and are often fully accredited. 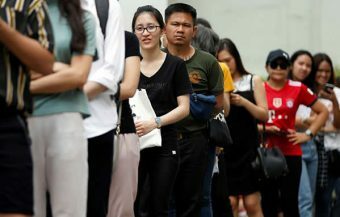 The business of offering employment abroad for Thai nationals is far more complex and requires legal sanction from authorities in Thailand including the appropriate licences. For foreigners setting such an operation, it is advisable to do so by incorporating a Thai company. However, the company must have as its director a Thai national. 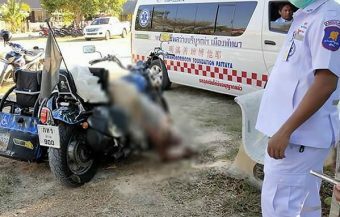 This individual must also be certified as having a clean criminal record by the Thai police. The company requires a licence to operate from the Thai Department of Labor. In addition there are very strict reporting requirements. Thailand is a signatory to many international agreement on labor and the company must uphold laws relating to equal opportunities and working rights. 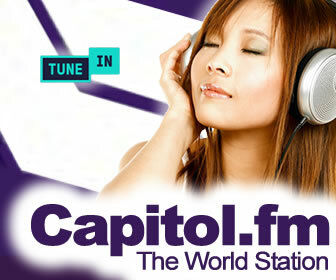 There are also regulations concerning the fees that allowed to be charged for such a service. The current international threat of human trafficking is one key reason why all such commercial activity must be tightly regulated for the good and well being of all parties. The Canadian Michel Roberge did set up a Thai company he founded Work West (Thailand) in Chiang Mai province 5 years ago. It appears that the company did, in fact, establish an employment service offering Thai students apprenticeship working in western hoteliers in 2013. An advertisement from this time written in Thai and English offers 10 positions as a cook in Florence, Indiana as well as front desk jobs, meaning clerical and junior management positions at the front of the hotel, at the Crown Plaza Hotel in Baton Rouge Louisiana. It is reported that a Thai manager was employed by the company. Thai police investigating the company and its founder have expressed a belief that the company did, in fact, process many people through its doors. However things turned sour somewhere along the line. It is reported that in 2013 the company ceased operation in Chiang Mai and some months ago the founder Michael Roberge, a man who in fact appears to be well regarded in the hotel industry as a chef, was arrested on the 18th floor of the Amarin Plaza building in the Pathumwan district of Bangkok on an arrest warrant issued by a Thai court in Chiang Mai in 2017. 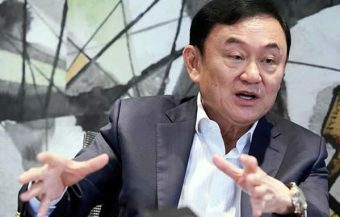 The former company owner stands accused on two counts of defrauding two Thai customers of the Work West of arrangement fees paid by the two nationals to find placements in the United States after which both Thai people recalled that the Canadian man simply disappeared. A job in the United States or Canada with an hourly wage but with all necessary arrangements for the job seekers to enter the United States. That is how Michael Roberge, a 37-year-old Canadian citizen who has lived in Thailand for years, appears to have scammed two Thai college students eager for secure employment in the United States and other western countries. 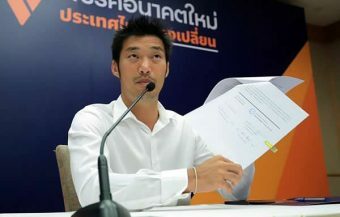 His detention in Bangkok on October 24 2018 following an arrest warrant issued by the Chiang Mai court last year. His employment service company Work West Co. Ltd claimed to connect clients up with short-term and long-term internships particularly in the United States. Now he is facing charges of financial fraud and operating an illegal overseas employment service. The Canadian is facing not only charges of fraud but also of operating the overseas employment venture without the necessary licenses or approvals. It is quite a serious offence in itself and could land him in jail for up to 10 years. Thai police have also ascertained that some of the jobs on offer by and promoted were false and in fact, fabricated by the Canadian. This could lead to further charges of a serious nature particularly as the business advertised online. In addition, he is facing two counts of fraud. 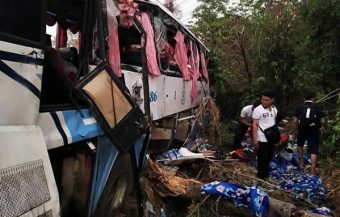 Thai police believe that there could, in fact, be many other victims of the employment operation. 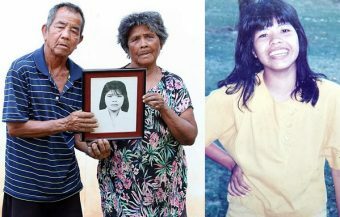 Thai police officer, Visanut Bangnamkhen, who is working as an investigator on the case, believes that there could well be many more victims. 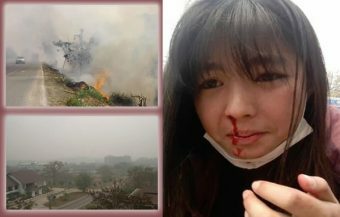 Speaking to KhaoSod English, a respected English news website in Thailand, at the end of October, he said: ‘Actually, this company processed thousands of students. Some did go overseas and some didn’t. Michael is still denying that he scammed anyone and says that the Thai employee did it all, but there’s no police summons for hem yet.’ It appears that the two cases reported to police relate to the activity of the Thai company in 2013. It is believed that Roberge has been living in Thailand since then and seems to have been still involved with the hotel training business. A website associated with a prestigious hotel training school in Bali had a feature on Roberge in April 2017 referring to him as a representative of a management company in Bangkok. The school seem delighted to receive Mr Roberge with glowing article and presentation. 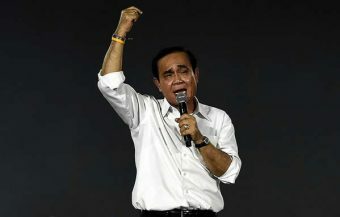 His scams were exposed after two victims reported their cases to Thai authorities. One of them told the police Roberge promised him an apprenticeship at the Pittsburgh Marriott hotel in Pennsylvania at an hourly wage of US$14 if he paid the Canadian an arrangement fee of ฿150,000. But as soon as he transferred the money, Roberge vanished. 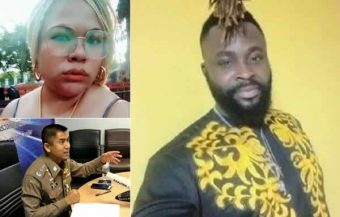 The other victim was also swindled out of ฿150,000 for believing that Roberge could get him an $8 per hour internship at a Thai restaurant in Miami, Florida. 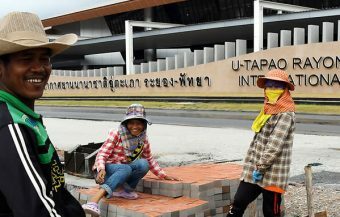 Both Thai nationals as university students were seeking valuable overseas experience. 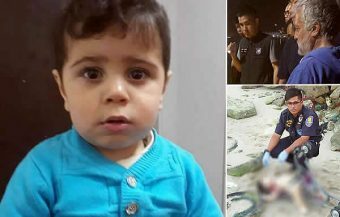 A warrant for his arrest was issued by a Thai court on July 4th 2017. 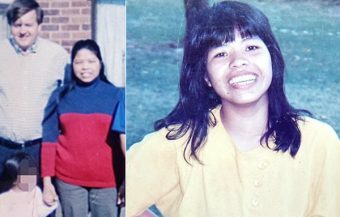 The police speculate that there may be more victims, and urge them to come forward. Work West has been shut down for some time. In fact, the company’s last job posting was put up in 2013.